Notes: February 1998 - Of remarkable appearance with massive bulging and a cavernous hollow with a large internal stem. Sadly the tree and its internal stem have been badly damaged by fire. The growth fed by the internal stem was discoloured. Girth recorded here is from Peter Norton in 2014. Latest information: 2014 Peter Norton: The church mostly dates from the 13th century with a few 12th century remains. 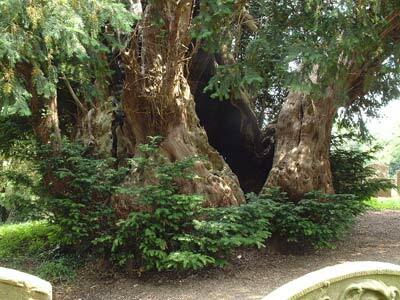 The largest yew, female, grows close to the path leading to the north facing porch. It was badly damaged by fire in 1998 and it is still recovering. A fine internal stem can be easily observed through the large basal cavity and this had a girth of 5' 2'' both at the current ground level and at 3'. Secondary wood is flowing over the old white wood on both sides of the cavity that faces the path. The bole swells considerably and exaggerates any girth reading above a few inches, subsequently a measurement was taken at the tree`s minimum girth which comprised of the root crown and the ground. 29' 9'' was recorded.